Today in our Attachment Parenting Series, we will be discussing Attachment Parenting from a Christian perspective. If you have written a post on faith as it relates to Attachment Parenting, please do share it with us in the comments below! We are our children's first picture of God. It is of utmost importance that the picture we give them is as accurate as our human selves can offer. This requires that we ourselves first have a holistic understanding of God’s character. When reading Scripture, it is helpful to take note of the many descriptions of God’s character. These descriptions tell us how God interacts with His children, and we can use them as a model as we raise our own children in love and grace. While the details will be different for each family, an exploration of God’s character reveals a strong congruence with the underlying values of Attachment Parenting. There are three distinct areas that support a relational, attachment-based style of parenting: God’s character, God’s design, and Christian instruction. We will explore each and its relation to Attachment Parenting below. God answers our cries (Jonah 2:2), draws us with loving-kindness (Jeremiah 31:3), and is slow to anger and rich in love (Psalm 145:8). He comforts us “as a mother comforts her child” (Isaiah 66:13) and has compassion on us “as a father has compassion on his children” (Psalm 103:13). His kindness leads us towards repentance (Romans 2:4). We discover more of God’s character in the parable Jesus tells about the prodigal son (Luke 15:11-32). After the younger son squanders his wealth on wild living and prostitutes, he returns to his father, hungry and ashamed. Rather than chastise him, his father was filled with compassion for him. He ran to his son, threw his arms around him, kissed him, and called to the servants to prepare a celebratory feast. The more we understand God’s character, the better we can present that picture of God to our children through our words and actions. We build their perception of God as we answer their cries, treat them with kindness, withhold our anger, lavish them with love, comfort them, have compassion on them, and celebrate them as a unique creation of God. Attachment Parenting encourages this responsive, wooing, relationship-based approach to raising our children. God created our babies, their cues, and our instinctive response to those cues. He gave us the hormones that facilitate bonding, the ability to nourish our babies through breastfeeding, and the means to naturally space our children through lactation induced amenorrhea. By design, babies cry to signal their needs, and their mothers respond to that cry both physically (as their milk lets down) and psychologically (by wanting to pick up and comfort or nurse the child). Our babies feel safest when sleeping near their mothers, and mothers as well often sleep easier when their children are nearby. Babies thrive on touch, and a high-touch attachment relationship offers physiological and psychological benefits to both parent and child. Breastfeeding imagery is used extensively in Scripture (see, for example, Isaiah 60:16, Isaiah 66:11, and Psalm 22:9). There is perhaps no place that should be more encouraging of this natural, God-designed practice than the church, and yet too often it is those within the church who hide nursing mothers in back rooms, holding fast instead to a misguided and misdirected notion of modesty. Breastfeeding is a mother's first foray into learning to read, trust, and respond to her child's cues. The infant, likewise, develops a strong emotional security as he learns to trust that his needs will be quickly and appropriately responded to. The more sensitive a mother becomes to her child's cues, the better the child becomes at giving those cues. This is the beginning of communication and connection between mother and child. As connection grows, the mother/child relationship becomes increasingly natural and instinctive. The resulting mutual trust and sensitivity is the basis of the parent/child relationship and the foundation upon which future discipline will rely. The better the mother knows her child, and the more the child trusts his or her mother, the easier discipline will be as the child grows. Each of the AP tools serves to strengthen that foundation, which will be built on with each passing year. (More about this in the next installment of the Attachment Parenting series, "Attachment Parenting: Beyond the baby years".) Not every family will use every tool or use them in the same way. It is the heart behind the tool – the desire to respond sensitively to our children’s needs and to seek ways to build and strengthen a mutually-trusting parent/child relationship – that is of true importance. Scripture offers many instructions for Christians on how to practically live out the commands to love God and to love our neighbour as ourselves. None of these instructions exclude children. The Bible instructs us to comfort those who mourn, to feed those who are hungry, and to love the unlovely. We are instructed to be compassionate, to sacrifice, and to extend mercy to others. We are exhorted to be gentle and kind, building others up through our encouraging words. When we are walking in the Spirit and practically living out our faith, our lives will begin to bear the fruit of the Spirit: love, joy, peace, patience, kindness, goodness, faithfulness, gentleness, and self-control. We circumvent the work of the Spirit when we accept a quick parenting fix in place of the sacrificial hard work involved in relational parenting, with its goal of heart-level change. This sort of convenience parenting – such as leaving an infant to cry alone, spanking a child, or yelling and punishing instead of guiding and teaching – serves the desires of flesh (ease, convenience, outward appearances). It may have short-term gains, but it fails to pay off in the long-term. When we are living according to the Word, however, we will seek to apply these exhortations not only to other adults, but to our children as well. We will comfort them when they cry, feed them when they are hungry, and sacrifice sleep to meet their nighttime needs. We will be kind and gentle, speaking words of encouragement into their lives. We will guide them in grace and mercy. We will demonstrate the fruit of the Spirit to them rather than demand it from them. In all these things, whatever we do “for the least of these”, we do for Christ himself (Matthew 25:31-46). Jesus told his disciples that “if anyone wants to be first, he must be the very last, and the servant of all.” He then took a little child and had him stand among them. Taking the child into his arms, he said to them, “Whoever welcomes one of these little children in my name welcomes me; and whoever welcomes me does not welcome me but the one who sent me.” (Mark 9:33-37). We are called to a life of loving servanthood. To deny such service to a child is to refuse Christ himself. Patience. Kindness. Humility. Slow to anger and quick to forgive. Protective and persevering. These must be the hallmarks of our love as demonstrated to our children. Attachment Parenting provides a holistic approach to demonstrating this love in the context of a healthy parent/child relationship. There are three heresies that have worked their way into much of the church, all of which serve to draw us away from a natural, instinctive approach to raising our children. These beliefs encourage a harsh, rule-based approach instead, often starting with newborn babies. Jesus died for the sins of all, breaking death’s hold on us and opening the way for our restored relationship with God. To say that further punishment is required is to negate the message of the Gospel, and yet many of the big Christian authors will tell you that your child’s salvation depends on you punishing them. Punishment is considered the method of paying for their sin and removing the child’s guilt. This is completely contrary to the message of the Gospel, which says that all of our sins have already been put to death by Christ on the cross. Punishing our child again takes away from that message. It says that what Christ has already done was not enough. The idea that any parenting method can save a child is likewise contrary to the Gospel. Only the Holy Spirit can draw our children to Christ. Only Christ can save our children through faith. This faith is a gift of God, lest any man (or parent) should boast. Moreover, punishment is often unrealistic, as we begin to demand more from our children than we expect from ourselves. We talk of God’s mercy, grace, patience, and kindness when speaking of ourselves; should we then demand perfect obedience from our children and punish them when they fail to achieve it? Our debt has been paid through Christ. We must be cautious, then, not turn around and demand payment from our children for their wrongdoings, lest we become as the unmerciful servant of which we were warned. Rather than saving them, punishment presents a distorted view of God to our children. God raises His children with grace and mercy, not punishment. In His love, He does allow us to experience the natural consequences of our actions, but He does not punish us or send us away from Him. Likewise, Jesus did not punish His disciples, but rather patiently taught them and guided them toward a fuller understanding of God. The idea that God punishes His children is contrary to His grace. It further serves to negate the Gospel, suggesting that further punishment is needed on top of what Christ has already accomplished on the cross. We feel pain when we sin because we are walking apart from God and from His best for our lives. This pain is self-inflicted as we choose separation from His loving guidance. When we repent and turn back to God, He forgives us without first demanding repayment or inflicting punishment. We are called to offer this same generous forgiveness to those around us - including our children. God is Love. God is good and merciful, the same then, now, and forevermore. It is a flawed understanding of His character that leads to delineation between the “wrathful” God of the Old Testament and the “merciful” God of the New Testament. Some argue that God punishes His enemies, those who are evil and unrepentant. Our children are not our enemies and their childish antics are not evil. Even if that were not the case, we are instructed not to take revenge, nor to repay evil for evil, for the Lord is judge and it is His to avenge. A strict focus on rules and behaviour suggests that what matters is our outward behaviour. Scripture tells us, however, that God looks at the heart. This misplaced focus also suggests that rules can keep us in line, and yet the Law proved otherwise – and “grace increased all the more” (Romans 5:20). There often seems within the Christian community to be a hyper-focus on verses intended for others. In this case, many parents quote Ephesians 6:1 (“Children, obey your parents in the Lord, for this is right”), and yet ignore the verse directed towards parents that follows (“Fathers, do not exasperate your children; instead, bring them up in the training and discipline of the Lord.”). It is not our place to make our children obey us; that verse contains an instruction for them, not for us. Rather, it is our duty to “bring them up in the training and discipline of the Lord”. Indeed, we cannot make our children obey us. We can make them comply with our instructions, but true obedience comes from the heart. That sort of obedience can never be demanded from anyone. It arises from a relationship of love and trust. As parents who wish to assist our children in fulfilling that command, we must tenderly cultivate a mutually loving and trusting relationship with them, in order that out of that they may respond to us in true heartfelt obedience. A proper understanding of child development enables parents to respond to their children in a helpful and understanding way. It allows parents to put aside the false notion that babies cry to manipulate rather than communicate, or that their child’s immature behaviours are sinful rather than normal (and ultimately healthy) developmental stages. With a solid understanding of age-expected behaviours in place, parents are able to actively and respectfully move their children from inappropriate behaviours to appropriate ones, guiding them towards what they should do rather than focusing on what they shouldn’t do. There is no fear in love (1 John 4:18). You cannot beat a child into salvation. A child is not saved through a parent punishing him in order to "atone for his sin". A child is not saved by "being good". A child is saved through a relationship with Jesus Christ - nothing more, nothing less - and anything that suggests otherwise is outright heresy. A child’s deepest understanding of God will be formed through their relationship with their parents. In order to ensure we model an accurate picture of God, we must first understand God’s character, design, and instructions for living. God’s character is one of kindness, compassion, and love. God’s design encourages nearness and responsiveness. Christian instruction points us towards the sort of sacrificial love that leads to the fruit of the Spirit being evident in our lives. Each of these three areas speaks to the heart of Attachment Parenting. Far more than merely the decision to breastfeed or co-sleep, Attachment Parenting encourages a responsive, relationship-based approach to raising our children. This is what an examination of Scripture calls us to, that we woo our children with kindness, guide them with gentleness, and respond sensitively to their needs. Attachment Parenting provides a holistic approach to demonstrating God’s love and grace to our children in the context of a healthy parent/child relationship. There are three lies that serve to pull us away from this responsive, relational, instinctive style of parenting. First is the belief that our children must be punished for their wrongdoings. Similarly, next is the belief that God punishes His children for their sins. Last is the belief that rules and good behaviour produce Godly children. Each of these beliefs is contrary to the message of the Gospel, and each serves to suggest that what Christ accomplished on the cross was either insufficient or unnecessary for our salvation and the salvation of our children. The wages of sin is death, separation from God. It was the sacrifice of Jesus that allowed restoration and reconciliation, opening the way to eternal life. Our children are saved through that relationship, not through punishment, good behaviour, or fear. God loves you, and He loves our children. We must be careful to treat them at all times as cherished creations of a Holy God. Not every parent will choose to use all of the AP tools, nor choose to use them in the same way. It is not the specifics that are demanded of us, but rather the relational approach behind them. The more we understand God’s character, design, and instructions, the better we can determine the specifics in a way that is right for our family, with an understanding of the underlying heart and purpose: responding sensitively to our children’s needs and seeking ways to build and strengthen a mutually-trusting relationship with them. The Complete Book of Christian Parenting and Child Care by William Sears, M.D. and Martha Sears, R.N. It would not have occurred to me to turn to the Bible to defend public breastfeeding, but it's heartwarming to know that it can be done, and is. This is the post I would write if I could! All these ideas have been floating around in my head and you managed to speak them so well & completely. I married into a very conservative Christian family and I'm the "hippie" of the group. (I was "gifted" the entire GKGW series.) I flat out reject the vast majority of current conventional american parenting ideas & technique and your blog bolsters me in my swim against the current! I love your blog!! I am surrounded by Christian people who believe the only way to raise a child is to spank them. I am a new mother who has been convinced otherwise. Thank you for putting this information out there. I absolutely needed this post. I came under fire recently when I posted my beliefs on spanking and the consequences. It was NOT received well by my fellow brothers and sisters in Christ. In fact, my statements (and Biblical references) we judged quite heavily. All of that has been weighing on my heart for close to a month now.. and causing me to doubt my belief in sharing the grace of the Cross, as well as Biblical truths of love and repentance with my daughter and allowing the Holy Spirit to work in her heart. This post came as a breath of encouragement to me. Thank you ever so much. You have no idea how much I needed this at this exact moment. I'm printing it out for future reference whenever I become discouraged. Beautiful. Thank you for this. Lately I have been learning about how deeply AP affects and challenges my character and my vices. Punitive, rule laden parenting seems to only validate the parent (obviously not so cut and dry, but generally speaking) and to pit parent against child. It's about the parent's schedule, the parent's rules, the parent's reputation. AP quite literally forces the parent to look out for the needs of others and place them above their own. I am being challenged right now with being a responsive, patient night-time parent. Ashley, Mama-in-training, I'm so glad this post was an encouragement to you both. It is encouraging to me to know that my efforts have been worthwhile. Practicing Mammal, I appreciate you raising the point that Jesus himself would have been breastfed until he was at least 3 years old. I will definitely check out your series; thanks for sharing! Michelle, what a powerful way to phrase it. Punitive parenting truly does validate only the parent and creates an adversarial relationship between parent and child. That "us versus them" mentality is difficult to move away from once it becomes ingrained in the relationship. This is absolutely awesome. :) Thank you very much for putting it together. I am going to add it to my spanking post as a resource. Absolutely wonderful! Very well presented. Thank you! This is so great, thank you!! Do you have any response to the rod passages in the Bible? I've read different explanations of this but I'm interested in your perspective and how you might express it. Wonderful wonderful post. Thank you for so articulately putting into words the jumble that is my thoughs. I was raised by the rod in a "Christian" home and the damage runs very deep. I struggle with seeing my Heavenly Father as loving and kind. This has been one of the biggest struggles in my relationship with him.I'm printing this one out. THANK YOU for this post--for reminding me what kind of parent I strive to be. Thank you all for your kind words. They are very encouraging to me. Wheeliemom, I do have many thoughts on the rod passages in Proverbs and I hope to get them down in a blog post (or two or three) by the end of the summer. In the meantime, the best response I've found is on the Parenting Freedom site here: http://parentingfreedom.com/discipline/ (the rod section begins part-way down the page). Michelle, I'm sorry for the pain you experienced and the struggles you continue to go through today. Those lies about God's character are difficult to uproot. I pray you find healing in time. Thank you Hippie, I read that article from "Parenting Freedom" and it is amazing!! I need to work up the courage to share this information with my Christian friends. Do you know of any Church or Christian group that encourages and supports this gentle (and truly scriptural) type of parenting? It would also be interesting to see how practicing Jews view these passages, especially the Rabbis and those who have the knowledge of the original Hebrew. if only others would be open to it! As you know, I agree with you 100% on this! So wonderfully worded and powerfully spoken. beautiful! couldn't have said it better myself! Wheeliemom, churches that support gentle parenting seem to be very congregation-specific rather than denomination-specific. There are some denominations that are less harsh than others, but even then it really does depend on the congregation itself. If you are looking for an online Christian AP/GD community, I highly recommend Gentle Christian Mothers. As for how practicing Jews view the rod passages, even that (from what I've read) seems to depend on the individual. If I find anything that speaks to a traditional Jewish understanding of those passages, I will be sure to share the link here. Great question! Thank you. I do really like Gentle Christian Mothers. Online information and support has been crucial to me so far along this journey, but there's still a big part of me hungering for face-to-face contact with other like-minded Jesus-loving mamas and papas! I'll just keep searching for that unique congregation or try making a group of my own. I understand your desire for that face-to-face fellowship. We went for a stretch without a home church and it was a very lonely time (though not entirely without benefits of its own). We have found the Anglican church to be very gentle. Lutheran as well. We currently attend a wonderful house church where our children remain with us throughout and the other parents are very likeminded. It is a difficult search, though, and very much depends on the congregation itself. I hope you find a church home soon. This is just beautifully written. It also really affirms what I have felt God lay on my heart about raising my daughter. Thank you for this entry. Thanks so much for your thoughts! I love the concepts behind AP, and I follow it because it is supported by so much research. But, sadly, I'd never thought to consider it from the Christian angle. I look forward to following your blog! but the one who loves their children is careful to discipline them." I am a big lover of attachment parenting and a born again christian, believe in kindness, being swift to hear, slow to speak and slow to wrath and above all the inerrant word of God. Having been spanked as a child a handful of times I can say that it was never administered in anger. I have a hard time neglecting this verse of scripture and wonder if you don't agree with spanking how you interpret this verse? Thank you for asking that important question, Miriam. I have shared my thoughts on that particular verse in a three part series; you can find part one here, along with links to parts two and three. Very well-written article! Gleaned a lot from it. God has certainly gifted you with a way with words! I am continuing to research AP/grace-based parenting and all that goes into them. I have 3 children, 9,7,and 12mos. I knew a little about AP with my first child but was led to believe it was the wrong way to parent, so we went a little more with a scheduling approach, let him cry a little. But with my 2nd child, did less with it as it never really felt comfortable. And with my 3rd child, we are totally AP and are continuing to look into grace-based parenting as our oldest child is causing us to re-evaluate our parenting style completely. Grace-based parenting is a totally new concept for me and it has been so refreshing (I suppose this is a good word to describe it) to read about. It doesn't have to be the "kids vs. parents" all the time. Thank you for putting this so well! Thanks so much for your clear articulation of these issues. I have been reading Naomi Aldort and others about AP, and struggeling with some of her premises. Eg ' there is no right or wrong, only love and fear' and 'children are not bad, they just have needs' . I believe we are all bad and all good; totally fallen and totally redeemed. I know I am. But I am really drawn to the methodology of AP. I am cut to the core at my own shouting/yelling/hitting habits. I hate it. And on the rare moments when I practice kindness, my children blossom. Anyway, I am a work in progress, and I really appreciate what you've written, and will read some more of your blog right now. I really found this piece an answer to prayer! I have been having a hard time reconciling "other" philosophies/ideas, with the Word, and bringing everything I read to the light of the Scripture, so this was really needed! I do have one question...that other people have brought up when I mention AP, and is something you touched on...sinful nature. I know you do not say that our children don't/won't sin, it's just how we react/act towards a certain action that makes a difference. Yes, Jesus died for our sins and He is the only way back to the Father, to complete forgiveness; however, this only applies when someone becomes a believer that Jesus died on the cross for our sins. A child is born in sin, and is a "sinner" until he reaches a point when the child receives Jesus as his Savior....and even so when having been saved and walking with God, we have that sinful nature in us...Could it be that how a child acts/reacts is not only due to a normal development but also due to that sinful nature which is in all of us? Aren't we selfish, and have a rebellious attitude a result of sin itself? This has come up because people I talk to have this erroneous idea that AP children are expected to never "misbehave" or do anything "mischievous". I guess....I can see the answer right there but I haven't been able to get to it fully...I always have a hard time explaining this to people...Help?! Thank you for your writings! Gilda, what a challenging question that is. There are many different ideas on sinful nature and forgiveness and salvation and how that all applies to children. For my part, however, when questioned in that regard, I find that the whole debate is a side issue from the heart of AP. My responsibility is always my actions. Am I behaving in a way that honours God and honours these children he placed in my care? Whether their actions stem from normal development or from sin nature should not at all affect my response. Regardless of the origin of their unwise choices, it remains my responsibility to gently and humbly guide them towards maturity and provide them with the resources they need to make wise decisions. I'm sorry that didn't fully answer the question you have been wrestling with, but I hope it was helpful in its own way. I can't just over look the fact that my Creator God and Father is also a JUST God. In Proverbs 3:12 it clearly states: "whom the Lord loves He corrects". How can anyone overlook some of the great teachings in Proverbs such as 13:24 / 10:17 / etc. Read the whole bible and ask for wisdom from the Holy Spirit in what it teaches. Verbal correction is indeed part of loving discipline. Please do point out if I have said otherwise! Correction, however, should not be merely external behaviour modification based on punishments with the goal of outward obedience, but rather true inward-focused discipline that walks alongside the child and guides them towards maturity. The proverbs are full of wisdom and truth, and to insist upon a strictly literal interpretation (and pseudo-literal application) is to lose the rich meaning they hold. I have examined the proverbs you mentioned in great detail in my three part series that begins here. Grace is such a difficult concept for us to understand, and even more difficult for us to accept for ourselves and offer to others. It is, however, the foundation of our faith. Prayers for you as you continue your journey. You noted that "God is Love. God is good and merciful, the same then, now, and forevermore. It is a flawed understanding of His character that leads to delineation between the “wrathful” God of the Old Testament and the “merciful” God of the New Testament." You cannot exempt the truth that God is also a God of order, judgement and wrath...then, now and forevermore. He does discipline his children when they have been disobedient. We as parents can exasperate our children if we let them have all the control and give them no boundaries, just as much as you can exasperate them by discipling out of anger. You have taken scripture out of context and molded it to fit the Attachment Parenting lifestyle. I am a Christian-I believe that Christ took on the punishment that I deserved because of my sin. The Gospel is one of grace and love, yes. But it has nothing to do with parenting and EVERYTHING to do with our sin and Christ's atonement for our sin and the AMAZING grace God has shown us as believers. The Bible is given to us to point us to Christ and how to live our lives constantly pointing the world and our kids even to Him. We cannot do this by scooting around the scripture-finding "loose application" to our fit our lives specifically is dangerous territory. I might have overlooked this, but you never once referenced the scriptures where God actually deals with parenting outside of the context of how you want it to fit AP. "We circumvent the work of the Spirit when we accept a quick parenting fix in place of the sacrificial hard work involved in relational parenting, with its goal of heart-level change. This sort of convenience parenting – such as leaving an infant to cry alone, spanking a child, or yelling and punishing instead of guiding and teaching – serves the desires of flesh (ease, convenience, outward appearances). It may have short-term gains, but it fails to pay off in the long-term." You are saying that I am in the wrong because I have left my child to cry alone and/or spanking them- The bible refers to spanking as a form of guidance and teaching. Leaving my child to cry has nothing to do with not loving my child and you should not make others feel that way because they do. There are circumstances in everyone's life where one if not all of these things has happened for one reason or another-good or bad. But please don't link a form of sin ("yelling, or punishing out of anger") with a form of parenting style like spanking or letting a child "cry-it out" they have nothing to do with each other and the bible NEVER calls these sins. It's dangerous to lead others into thinking this is the BEST way or the ONLY way. As a mother I have met a lot of moms (including myself) who struggle with doubt, confusion on how to parent and guilt (because of the fallen world we live in).....this type of mind-set and linking it to how the Bible is one-sided on this issue is dangerous and not uplifting or helpful to fellow believers. People sin. We all do. God punishes us for our sin, but He has also saved us by grace alone. Praise the Lord! People have been wronged in the past by their parents, they have messed up as parents themselves, but by the grace of God we can continue to strive to be more Christ-like. Loving, merciful, and obedient, teaching our kids to love as Christ loved is the key, you are right that is encompasses so much and to often times can't be completely explained. But just as my God is a loving and merciful God, He too is just and disciplines me in my sin. You can't separate the two and for that I am so grateful. There would be no Gospel otherwise. Thank you, Mrs. Sanders, for taking the time to share your reaction to my words. First, I do want to apologize for causing you to feel discouraged. Creating hurt is never my intention with my writing. However, I do also want to encourage you to lean into those moments of uncertainty and doubt. Those moments may be the nudge of the Holy Spirit, and often God uses them to draw us into a deeper understanding of Himself and (speaking specifically to the topic at hand) His desires for us as mothers. Prayerfully consider and examine whether there is truth to those doubts; perhaps you will change your mind or perhaps you will find renewed confidence in the particular belief in question. I admit I am feeling frustrated with the repeated responses that equate Attachment Parenting (AP) with permissive parenting. As you said, God does discipline His children, and we must in turn discipline our own. I have written extensively on the topic of discipline in this and other posts, cautioning repeatedly against the dangers of parenting without boundaries. I do disagree with you, however, that the Bible refers to spanking as a form of guidance and teaching. I have written in detail about the subject in a three part series on the "rod verses", which begins here. "Leaving my child to cry has nothing to do with not loving my child and you should not make others feel that way because they do." A parent's love for their child was never once questioned anywhere in this article. We all love our children and are doing our best with the resources and knowledge that we have. Children - my own included! - are sometimes left to cry due to unavoidable situations, such as a mother's need to use the bathroom or tend to an urgent situation with her other children. That, however, must be differentiated from the practice of leaving an infant to cry alone with the express purpose of teaching them some sort of lesson (whether that lesson be to put themselves to sleep, to wait until the "proper" time for feeding, that they are not the center of the world and their cries will not automatically be answered, etc). I do wholeheartedly believe that the parents who practice this form of infant "training" are sincere in their belief that they are doing what is best for their child, and I don't for even a moment question the depth of their love for their child. That does not, however, mean that the practice itself should not be questioned. An infant's cries are his only method of communication, and our older children's cries are likewise valid and worthy of our response. Even within a relationship-focused approach to parenting, such as AP, there are as many ways to parent as there are individual children. My children have both thus far been raised in an AP manner, but the details of such are very different because they are very different. There is no "one way" to raise our children. I do very much believe, however, that there are damaging parenting practices, along with the accompanying attitudes and practices towards children, that are taught in the church and must be discussed. We should not shy away from these conversations, challenging though they may be, simply because they cause us to feel uncomfortable. Can I just say how absolutely amazing you are! This article needs to be published in a mainstream magazine for every single parent to read! I struggle with the ideas of modern parenting all the time, and practice attatchment parenting with my 15 month old daughter since birth. Our society's way of thinking is so corrupted compared to the way God intended us to raise our children. You keep writing these posts! God is using your words. He sure encouraged me through them! Thank you so much, Anna; that is so encouraging! What about having respect for your child's choices by letting them experience both the negative and positive consequences of their choices? What about discipline vs. punishment? I'm not clear on what you're asking, Heather, but I'll try my best to answer. I wholeheartedly affirm that discipline is good and healthy and positive, while just as wholeheartedly believing that punishment has no role in discipline. I discuss the difference between the two in the latter link. As for allowing the child to experience the consequences of their choices, that is such a broad subject that no single answer will suffice. A child who refuses a coat, for example, may end up a bit chilly on a cool day, but the consequences would be far more severe if the weather was such that frostbite or hypothermia was a possibility. Whether or not we allow our children to experience the consequences of their choices depends on the age of the child, the unique needs and personality of the child, and the situation in question. Parents can swing to extremes on both ends, either by constantly "rescuing" their child from experience the negative natural consequences of their actions, or by showing a lack of mercy, grace, and understanding by taking a harsh "you made your bed, now lay in it" stance. I personally affirm a middle ground approach, where the (age-appropriate) responsibility is on the child to rectify the situation created by their actions. Rather than either rescuing or punishing the child, the parent's role is to guide, advise, and support the child through the stages of this process. From the punishment article linked above: "Discipline shows the child what they have done wrong, gives them ownership of the problem, gives them options for solving the problem, and makes use of natural or logical consequences. It does not shame the child or make him pay for his errors." Punishment, conversely, prevents the child from learning how to take responsibility for his actions. Wow, you are one courageous mamma! Thank you for sharing your insights so thoughtfully and sensitively. They inspire me and mirror many things I believe in my heart to be true about attachment parenting my children, and it's relevance to my relationship with the Lord. Attachment parenting has created a whole new understanding of my role as a parent, and deepened my relationship with God in so many ways. The more I learn, the more I can see how this is genuinely 'natural' parenting. I have just joined your blog, and am so thrilled to have stumbled across your beautiful, God-loving hippie self. You are a wise woman of God! I will be reading more! Your responses are spot on. I completely understand where you are coming from here, my husband and I practised attatchment parenting and extended breastfeding with our sons -they were 2 and half and 3 and a half years old before nursing came to a child driven mutually satisfactorily gentle weaning. There is only 17 months between them so you can do the math and work out there was some tandem nursing in there as well! We have truly reaped the benefits of parenting in this way, our sons were born to us when we we were in our early to middle 40's, we were completely blessed by the welcome addition of the babies to our family. I have 2 daughters born in the early 80's from a previous marriage and my husband had never had children. Well our boys are now 11 and almost 13, we have continued attatchment parenting by choosing to educate them at home-it seems to be the natural extension to the family life we have created. I work full time in women's health as an IBCLC, encouraging woemn to also understand the purpose of breastfeeding in the wider context and not just choosing the right milk! Dad is home full time with the boys- agreat set up that benefits all of us-he has ADD and dyslexia and this lifestyle works well for him. However we were not prepared for the new challenge to face us-I have recently been diagnosed with Non Hodgkins lymphoma and have recently had surgery and am now in the midst of chemotherapy, The decison to have our boys at home and close to us has made life so much easier to manage-imagine having to face school and society without the security of being firmly attached to your parents, grounded in the Christian faith when you have such things happening at home. I am relatively well although chemo is not without it's challenges but we face each day together with God's love surrounding us. Take heart attatchment parenting will provide your family with benefits for years to come. Ohhh, I loved this. Beautiful! 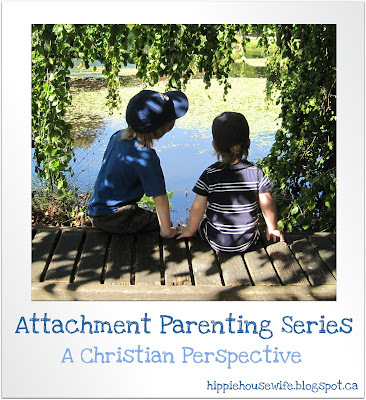 I especially love the connections you make between attachment parenting and God's character. You, however, were much more thorough and did a wonderful job making connections to specific Bible verses throughout Scripture. Awesome! I'm totally sharing this! I'm very surprised at the number of people using the "Rod" Proverb against your interpretation of Christian based AP. Personally, I don't disagree with the Rod Proverb only the interpretations that limit it's use to a violent means of discipline - a "rod" can have many uses beyond a type of disciplinary weapon. It can be a tool to lead, lean on, direct, support, etc. which are always to discipline within an AP mindset! One of the greatest things we can give to our children is the feeling of trust - a child who trusts is not free from wrong behavior or actions, but rather is given the best tool towards improving on their short comings by knowing that there is always someone there catch them. I guess I don't see the ideas of faith and trust as too dissimilar. I just wanted to thank you for writing this article. I have recently felt the way I parent needs to change in some ways. I enjoyed reading what you wrote and noticed you define discipline and punishment as not being the same. I have heard that only once before and was wondering where these definitions come from? Is it part of the AP style? Great post! I'm particularly reflecting on your words regarding "God punishes His children when they sin." You've got some good points. Your post also reminds me of something I just read..."Instructing your children in the Lord means spending time with them so they can see how you live out the gospel." It's from a new book by Dr. Tony Evans called, "Raising Kingdom Kids: Giving Your Child a Living Faith." In it he says, "It's far easier to SHAPE A CHILD than to REPAIR AN ADULT. Raising kids who recognize and retain their identity as children of the King launches healthy adults who have the capacity to stand strong in their faith." This is has been a solid, thorough, inspirational and affirming book for me. I love it and HIGHLY recommend it for all parents! This post resonates with me. I have heard many Christians justify their harshness toward their children with misused Scripture. We are taught to love our neighbors, to be patient, kind and long suffering even to our enemies. However, the buck is somehow supposed to stop at our children. God has entrusted our children to use to raise in the fear and admonition of the Lord. We have to encourage a love and understanding of the Lord. Our children will understand God's grace and forgiveness, tender loving care when it is demonstrated. We are supposed to be shadows of God's love to our children. How can we be this if we treat our children worse than enemies?? Thank you for your encouraging post. Thank you for this! Yes, yes, a thousand times yes. Thank you. Laura, me too. Maybe we can start our own group? LOL - I know there are support groups out there for moms like us, but I think they must be exclusive. Oh my goodness! Yes. I am so happy that I found this post. (Like happy to the point of tears.) Over the past couple of years I feel like my parenting chooses have come under attack for other that I worship with. My youngest is 19 months old and still breastfeeding. I have had to defend breastfeeding and extended breastfeeding. We also bed share and have had down cast looks and comments made about that. Spanking has also been a hot topic. I feel that some other look down on me because I choose not to hit my child. Such excellent posts, Jessie! Thank you for sharing them! Follower of Jesus, wife to my childhood sweetheart, and mother to our five children. Lover of books, chocolate, sunshine, and a good latte. Seeker of a more intentional life.